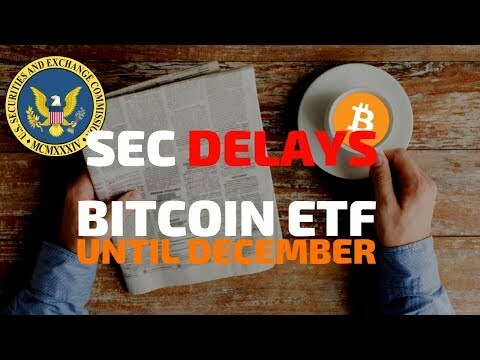 In this video, Mattie talks about the SEC delaying the bitcoin ETFs until December. He also talks about Danske Bank and the money laundering case as well as Ripple. This is a daily segment. Winklevoss Twins ETF Rejected, MasterCard CEO Calls Crypto Junk, BTC is Down. Is There A Light In the Tunnel? No bull run this year, all the way bear. Am I the only one that saw RCN go up?!!! In the SEC letter it does not say anything about a delay….. don’t know why many are spreading misinformation, type in ‘Delay” in the PDF and see if you see it show up. It doesn’t. I’ve been saying the same thing. They just said that they are looking into the ETF now and they’re looking for more comment. ETF doesn’t matter. Bakkt and Fidelity are the real tickets. No wonder only 1% of subscribers are viewing your videos. It has not been delayed yet!!! I I’m 100% sure it will be delayed in the next week but it hasn’t yet. They want to stop the bull run in December? What bull run? Crypto is dead. No exchange I use have etn surprisingly. Where is the proof? Noone else is saying it’s delayed?? I think only 1% of they’re subs are viewing because about 99% of them sold and ran home crying somewhere between Feb-July. the Commission designated a longer period within which to approve the proposed rule change, disapprove the proposed rule change, or institute proceedings”. They didn’t change the 30 Sept. deadline with the Sept. 20 announcement.